A man opened fire on people waiting at a school drop-off point and then fled on a moped. Rabbi Yonatan Sandler of Kiryat Yovel in Jerusalem and his sons Aryeh, 6, and Gavriel, 3.5, were murdered in Toulouse Monday morning, as was 8 year-old Miriam Monsonegro, daughter of the director of Ozar HaTorah Toulouse, Yaacov Monsonego. Binyamin Toati, Head of the France Desk of Bnei Akiva, told Arutz Sheva before the names were published that there are reports that the man who was killed is a rabbi who served as an Israel shaliach (emissary) at the school and that two of his children were killed with him. 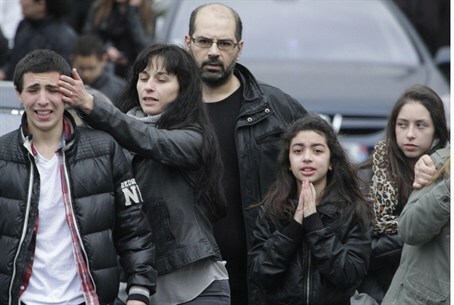 French press reported that two children were among at least three people killed in a shooting outside a Jewish school. Two other children are reported fighting for their lives. The French news reports said the dead are a teacher and two children, and that two other children were badly wounded. They said a man opened fire on people waiting at a school drop-off point and then fled on a motorcycle. The gunman used two weapons – one with a caliber of 9mm, the second with a caliber of 11.43 mm. France's Interior Ministry ordered increased surveillance around Jewish schools, and Interior Minister Claude Gueant said he will visit the school on Monday morning. The Chief Rabbi of France, Gilles Bernheim, said he was "horrified" by what happened in Toulouse. "I am bruised in my body and my soul," he added. The shooting comes three days after three French paratroopers were shot dead by a man 30 km. from Toulouse. AP reported that two French paratroopers were shot in the town of Montauban, near Toulouse, on Friday, when a gunman on a black motorbike pulled up at a cash machine and opened fire. An 11.43 mm. weapon was used in that attack as well, according to the news reports. Police saw a connection between those killings and to another deadly shooting of a soldier in Toulouse just over a week ago. Making the connection might obscure the anti-Semitic character of an attack aimed specifically at a Jewish school.